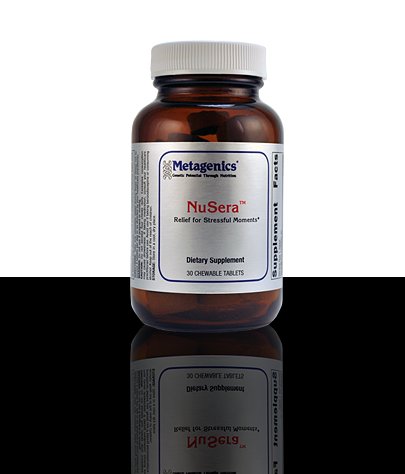 NuSera® is formulated in a great-tasting, chocolate chewable to help promote a feeling of calmness and relaxation during times of stress. This science-based formula features a clinically effective dosage of LactiumPure®—a patented, bioactive decapeptide—which research suggests promotes a healthy response to stress. In clinical studies, this unique ingredient was shown to boost the body’s ability to manage stress, which is important for maintaining a healthy lifestyle. Clinical studies suggest LactiumPure®†—the patented, active ingredient in NuSera—improves stress response measures, including physical and emotional reactions. Research suggests LactiumPure may influence the metabolism of cortisol, the stress hormone. In vitro studies suggest LactiumPure positively influences the activity of gamma-aminobutyric acid (GABA)—a calming neurotransmitter.